A bit behindhand with this, but I had fun writing a chapter in a new collection from NESTA on robots and the future of labour. 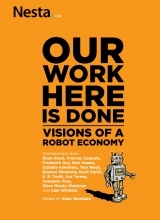 The other contributions were essays from proper experts on robotics, economics, and innovation. Mine was on images of robots in science fiction and how they might help us imagine the future of work, or the lack of it. You can download the whole thing from their website here. This entry was posted in News and tagged NESTA, robots, science fiction on 23 October, 2014 by Jon Turney.